For years, the telecommunication incumbent, Algerie Telecom (and its mobile arm Mobilis), has enjoyed a monopoly over the provision of telecoms services in Algeria. But in 2002, the telecoms market was opened up to competition with the arrival of Djezzy (part of Vimplecom group, which acquired the previous owner, Orascom Telecom in 2010), and Nedjma (part of the Qatari group Ooridoo, previously Qtel) in 2006. Improvement in network coverage, commoditization of mobile handsets and development of increasingly competitive tariffs and offers helped further expand access to voice and messaging services as well as accelerate the growth of the market. As a results, the mobile penetration, i.e. the number of SIMs in the market per 100 inhabitants, was nearing 100% by the end of 2011 (see Figure 1) , compared to a fixed-line penetration of 8 lines per 100 inhabitants, a figure that remained relatively flat over the last few years. Mobile operators have largely benefited form this boom – Djezzy was until very recently Orascom Telecom’s most lucrative unit, and Wataniya continues to register year-on-year growth of its revenue and subscribers. This can be partly attributed to the predominance of prepaid subscribers (i.e. where a customer needs to recharge her account before using a service), which tend to yield high profit margins even if the consumer recharges by small amounts. These benefits have also helped the operators offset the somewhat unpredictable business environment, as illustrated by the ongoing debacle of Orascom Telecom with the government . Despite the market showing signs of saturation, there is still room for more growth , particularly since Algeria is now the only country in North Africa who has not yet launched 3G, the next generation telecommunication network which promises faster data download over mobile compared to existing 2.5G (also known GPRS) technology currently in operation in the country. Mobile operators in Algeria contribute directly to the economy through employment, income taxes, and fees collected for spectrum licenses. 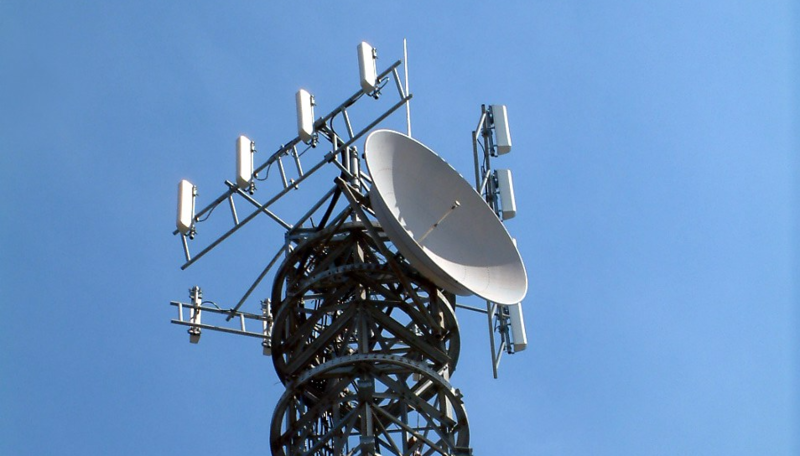 In addition, 3% of their revenues are paid annually to the universal fund, which is used by the government to expand coverage of telecommunication services to areas where it does not make economic sense for the operators to do so. The contribution of operators to the economy in terms of foreign direct investment (FDI) has been large, especially in the early stages of their network rollout and commercial expansion, but whether the market has become sufficiently competitive can be debated. This is partly due to the limited (and late) actions taken by the regulator to create a level field for the three mobile operators, and this inaction helped establish a private monopoly, Djezzy, after displacing the public one, Mobilis. The mobile sector brings in contributions to the economic activity from other players in the value chain too, such as handset importers and distributors, network equipment suppliers, service providers, etc., though the prevalence of the phenomenon of tax evasion in this sector considerably reduces its direct contribution to the treasury. 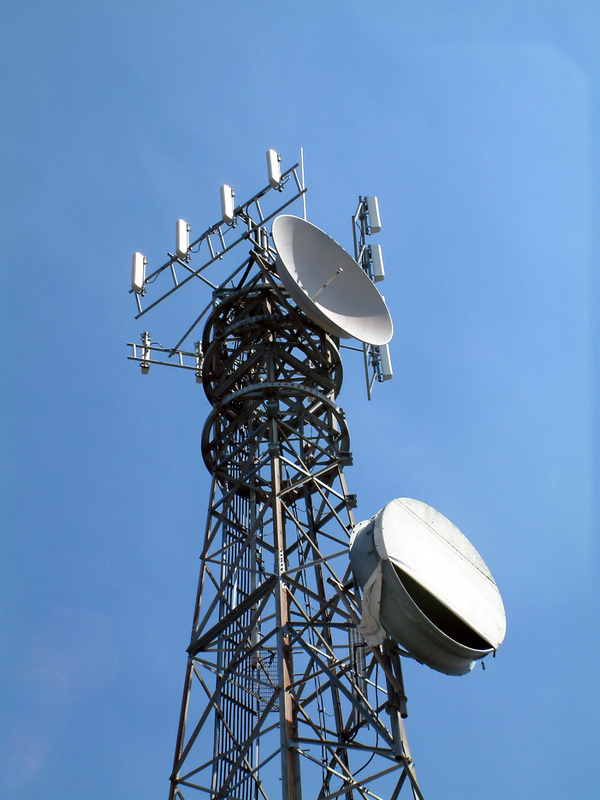 A number of studies have attempted to quantify the positive contribution of telecoms to economic growth in developing markets. For instance, Waverman (2005)  found that a developing country that had a 10% increase in mobile phones penetration between 1996 and 2003 would have enjoyed a 0.6% per capita GDP growth than an otherwise identical country. According to an analysis conducted by the World Bank (2009)  of 120 countries, for every 10% increase in mobile phone penetration, there is a 0.81% increase in GDP per capita in developing countries, which can reach up to 1.2%. A more recent study conducted by GSMA (2012)  showed that a 10% increase in mobile penetration increases total factor productivity (defined as a measure of economic productivity) in the long run by 4.2%. Finally, another study commissioned by the World Bank (2009)  found that an increase of 10% in fixed and mobile broadband penetration corresponds to a 1.38% increase in GDP in developing countries. Algerian official figures show that the telecommunications market’s total revenues for fixed and mobile has grown by 17% (from $4.7 billion in 2010 to $5.5 billion in 2011), contributing to only 4% of the GDP . By comparison, the same sector contributed 8% of GDP in Morocco, and about 12.5% in Tunisia in 2011 according to the same source. While this difference can be partly explained by the high level of Algeria’s GDP compared to its neighbouring countries, it also shows that there is scope for the sector to increase its share of non-hydrocarbons revenues. The aim of the Algerian government is to raise the contribution of the telecoms sector to 8% of GDP by 2014, while creating 100 000 direct jobs in the industry and 300 000 indirect jobs. Bearing in mind that these figures may seem over optimistic, one pivotal lever to achieve this growth will be from the growth of the fixed broadband market, including continued deployment of fibre network in urban centres and the introduction of fast mobile data services to the wider population. The introduction of 3G technology will likely introduce changes to online usage, as consumers will shift part of their time (and spending) to mobile Internet. According to StatCounter Global Stat , 97.43% of connections in Algeria were made from the desktop, and only 2.57% were made from mobile between January 2012 and January 2013. This figure contrasts with 5.37% in Morocco, where 3G was launched in 2007, 4.59% in Egypt, with 3G launched in 2008, 4.69% in Tunisia, where 3G was launched in 2010. Increased awareness of Internet services. If we use Facebook as a proxy for Internet usage growth in Algeria, we find that the population of Facebook users has grown by 15.6% in only six months to March 2013, reaching more than 4.3 million users . This shows that more people are accessing Internet services in Algeria despite being limited to fixed broadband access either at home or more commonly in Internet cafes. Increased affordability of devices. The commoditization of handset manufacturing and the economy of scale are making it possible to purchase a 3G-enabled handset for under $50. This allows consumers who did not have (or could not afford) a PC and a fixed connection at home to finally experience the Internet on the go. Mobile broadband is far-reaching. Despite the growth in fixed broadband penetration in the country, it currently remains confined to the urban centres. Mobile broadband will lower entry barriers and extend the reach of the Internet to users living outside urban centres. The introduction of high-speed mobile networks, such as 3G, has a larger impact on the economy than traditional mobile telephony and messaging services because it facilitates the creation and dissemination of information. However, very few studies exist to quantify this impact. A recent econometric analysis by GSMA  of the relationship between 3G connections and economic growth in developing and developed market found that an increase in penetration of 3G services (i.e. substituting 2G with 3G connection) generates significant economic benefit. This particular study posits that for a given level of total mobile penetration, a 10% substitution from 2G to 3G penetration increases average annual GDP per capita growth by 0.15% in developing markets, and that a 10% expansion in mobile penetration increases productivity by 4.2%. rs. 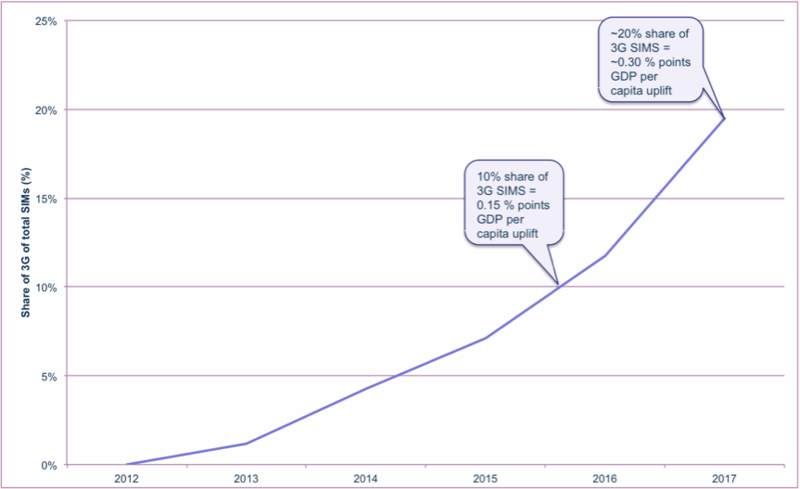 Assuming that 3G will be launched in mid-2013, and that growth rate will be twice as fast as that of Morocco during the period 2008-2011 (because of the drivers cited above), the share of 3G of total SIMs could account for 19.5% by 2017 (see Figure 2). As a result, one can expect an increase in the average annual growth rate of GDP per capita to be around 0.3% over that period (0.15% points for each 10% increase in 2G-to-3G substitution, as per GSMA’s 2012 econometric model) . While 0.3% increase over the next four years seems small, it has to be taken in the context of GDP growth over the same period. According to the World Bank, GDP per capita based on local currency has increased by 3.75% between 2008 and 2011. If we assume a similar growth rate for GDP per capita over the next 4 years, then a 0.3% uplift will have more significant impact considering that this is a contribution from a non-hydrocarbon sector. Despite the potential of 3G to contribute positively and quantitatively to economic growth, there are factors that may dampen the demand for mobile data connectivity and diminish its impact. Many such factors have been observed in other developing mobile markets. Among these, data cost could be the primary inhibitor for the adoption of 3G. In developing markets, telecommunications expenses as a percentage of income range from 2% to 5%, with Algeria being in the top tier if one considers a minimum monthly spend of about DA800-DA1000 ($10-$12.6). Operators will need to educate consumers about the benefits of data services to help justify spending a higher share of their disposable income on telecom services. A related dimension to service cost is the quality of service. If operators are not able to provide a sufficiently good user experience when connecting to the Internet, users could switch back to fixed broadband, thus limiting mobile broadband for light usage only. Another factor is the cost of smartphones. As these become more prevalent, there is a risk that they will be a higher burden on households to acquire. The government – through the telecommunication regulator body, ARPT – should realize the enormous growth that the telecom sector has brought to the country, and the indispensable role it can play for future economic and social development. This is the time to lead this sector to the next stage of progress by freeing more spectrum (currently used for broadcasting of analogue terrestrial TV) to accommodate the growth in mobile data demand, and by creating a healthy competitive environment to drive price reduction, increase the uptake of mobile data service and drive further investment in this sector to improve the quality of service. While the introduction of 3G should not be delayed any further, it should be accompanied with regulatory and economic measures to ensure maximum value to the users as well as encourage entrepreneurship to nurture the development of new business and social ventures that can play an active role in, and benefit from, this new digital economy. The true mobile penetration is lower than 100% because this calculation does not take into account users with multiple SIMs. Djezzy has been hit with millions of dollars in back-tax bills and fines since 2008 and has been banned from importing equipment and transferring its profits overseas, crippling its capacity to invest in network expansion. The current mobile penetration is actually lower than those of Tunisia and Morocco, which have both already exceeded 100%. Waverman, L., Meschi, M., Fuss, M. A, “The Impact of Telecoms on Economic Growth in Developing Countries.” The Vodafone Policy Paper Series 3, Vodafone, (2005), 10-24. Qiang, Christine Zhen-Wei. “Mobile Telephony: A Transformational Tool for Growth and Development.” Private Sector Development, Proparco’s Magazine 1.4 (2009). 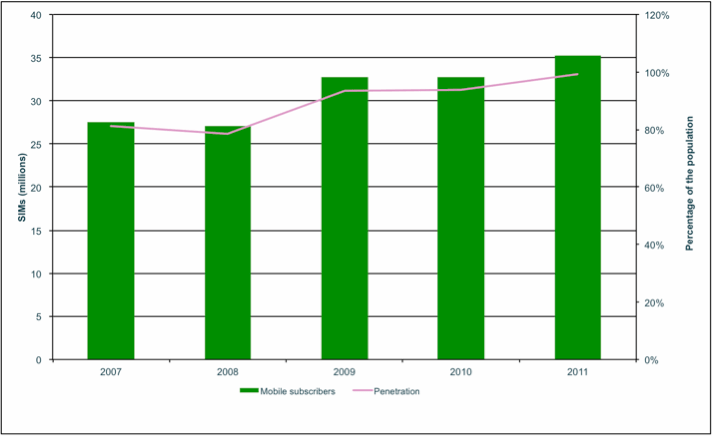 Deloitte/GSMA, “What is the impact of mobile telephony on growth?” (2012). Qiang, Christine Zhen-Wei, Carlo M. Rossotto, and Kaoru Kimura. “Economic impacts of broadband.“ Information and Communications for Development 2009: Extending Reach and Increasing Impact (2009): 35-50. Note that this figures does not include the incremental increase in GDP per capita resulting from the increase in the level of mobile penetration. 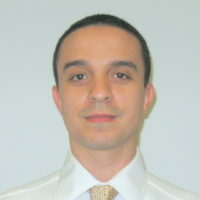 Dr. Karim Yaici is an industry analyst of telecommunications and media markets in the Middle East and North Africa. He has previously worked as a research engineer in the Centre for Communication Systems Research (CCSR) and Vodafone Group R&D (UK). Karim holds an MSc in Information Systems Management from the University of Southampton and a PhD in human–computer interaction from the University of Surrey.